Tim Keller writes in nuanced language. 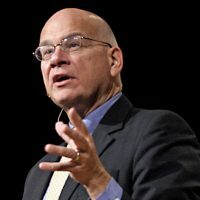 But in his latest column in the New York Times, the incarnation of the intellectual think-tank of the American religious left (as embodied in Tim Keller) has a simple message: Christians shouldn’t vote straight-line Republican. Projecting himself as above politics, the man who has asserted more times than I have fingers that he is greatly influenced by the Frankfurt School of Marxism, wants evangelicals to know that they should vote for both parties, and that both the Democratic National Convention and the Grand Old Party are equally as virtuous. His goal is simple, and that is to get as many evangelicals as possible to vote Democratic in the upcoming 2018 election, shifting the longtime tradition of evangelicals forming a politically conservative voting block. Keller, who is more a political ideologue than a theologian, gathered several months ago with other Marxists and leftists to strategize on how to pull as many evangelicals to the political left as possible before the next election. We wrote about that in the post, Marxist Brain Trust Gathers at Wheaton to Discuss Moving Evangelicals Left. Any naivety that Keller’s New York Times column is just a simple exhortation for Christians not to be beholden to a single political party (as some claim) should be betrayed by his lifelong allegiance to Marxist theory and his April meeting with evangelicals where they strategized ways to make evangelicals vote Democrat. Of course, there is not an inkling of Scriptural data to suggest that either Daniel or Joseph had any social agenda whatsoever, least of which was working “for better public schools.” And while a justice system should not be weighted toward the rich, it should also not be weighted toward the poor, which is precisely the goal of Marxists like Keller. Regarding our current supposed need to end racial segregation, one wonders exactly what institution in America still lacks integration, except for perhaps jazz music and professional hockey. Of what is Keller speaking? Nevertheless, while believers can register under a party affiliation and be active in politics, they should not identify the Christian church or faith with a political party as the only Christian one.